Neil Tattersall, left, with his Skipton October prime lamb champions, joined by helpers, among them judge James Dewhirst, right. Mr Tattersall, who trades as P&N Tattersall at Town Farm, saw a policy of concentrating on quality as opposed to quantity when breeding commercial lambs again pay dividends at the monthly fixture. His show victors also came out top on price when selling for £110 per head to regular buyer Saj Shann, of Yorkshire Halal Meats for its supermarket in Alice Street, Keighley, who also acquired the reserve champions at £100 per head. This was the same price paid for Mr Tattersall’s top price pen at Skipton’s September prime lamb show. He currently runs some 170 ewes, mainly Continentals. 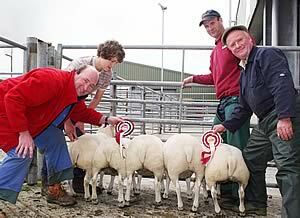 Yorkshire Halal Meats also paid £67 each for the second prize pen of Mules from Bernard Simpson, of Pateley Bridge. Another regular West Yorkshire buyer, Keelham Farm Shop in Thornton, Bradford, once more stepped forward to buy the prime cattle champion for the fourth consecutive month, also adding the reserve champion for good measure. The title winner, a home-bred Limousin-cross heifer presented yet again by Jimmy Baines, of Trawden, who has been champion at every monthly show since May, sold for the day’s top call of £1,388, or 259.5p/kg. The runner-up, the second prize Limousin-cross heifer shown by another prolific Skipton prize winner, Calderdale’s Brian Lund, of Walshaw, Hebden Bridge, joined Keelham for £1,108.23, or 228.5p/kg, with the Denholme & Brighouse Road shop making a third prize-winning acquisition at £1,262, or 225.5p/kg, for Jim Baines’ second top price Blonde-cross heifer. Mr Lund himself landed a championship and reserve championship double in a standalone show for cull cattle with two home-bred British Blue-cross cows aged 11 and ten years respectively. With 13 calves between them, both sold for exactly the same price - £928 or 135.5p/kg, the victor to S&JS Thompson, of Gargrave, the reserve to JF Thompson, of Preston. Prices in the 30 to 48 months prime cattle class were headed at £819 (138.5p/kg) and £817 (135.5p/kg) by two black and white heifers from JG Hall & Son, of Gargrave. Cull cows sold to an overall average of £643.80, per head, or 102.0p/kg, the reduced average reflecting the increased entry of plain black and white cows straight from the parlour. A Brown Swiss from D&P Brown, of Ramsgill, was the top-priced female at £937, or 130.5p/kg, while the leading performer on price at £1,464, or 141.5p/kg, was a Blonde bull from A&SL Throup, of Silsden. Back with the prime sheep - over 4,700 head in total - trade was again easier on the week, though the overall prime lamb average of £65.73 per head, or 156.7p/kg, for the near 4,000-strong entry was not helped by an increasing amount of lean and under finished lambs finding their way onto the market. In the show classes, defending monthly champions Frank and Robert Fielden, of Todmorden, were again to the fore with the third prize Beltex-cross pen, which joined Vivers Scot Lamb in Annan, for £90 each. Suffolk prices peaked at £78 per head for the second prize pen from JP&KE Hartley, of Beamsley, which fell to Shropshire-based Euro Quality Lamb, with the red rosette winners from CD&RF Kitching, of Threshfield, selling for £64 each to JW Bowling, of Wigan. CCM Stockperson of the Year, Robert Crisp, of Calton, picked up another first prize rosette with the Mule show class winners, which also headed the breed prices at £69.50 per head when joining regular North Yorkshire buyer Andrew Atkinson, of Felliscliffe. Dunbai Foods, of Preston, paid £54 a head for the first prize pen of horned sheep from G Huck & Son, of Bordley. Stephen Pepper, of Oxenhope, also achieved three figures with a Beltex-cross pen knocked down at £108 per head, or 229.8p/kg, to Riley Bros, of Dunnockshaw. Carleton’s Ross Greenwood judged the prime cattle show classes and James Dewhirst, of Lothersdale, the prime lambs. Phillip Bolland Trailer Training and Guy Machinery again sponsored.